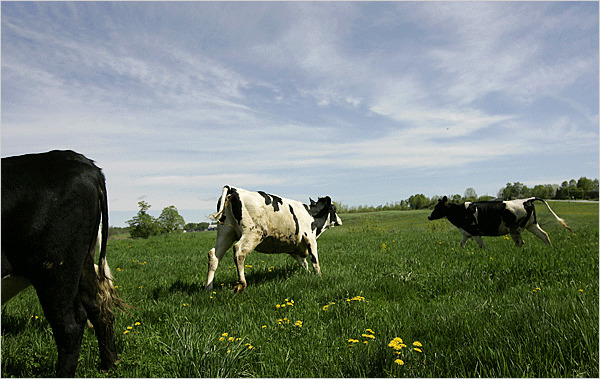 I came to a junction in the back roads of my mind the other day when I read an article in the New York Times about organic dairy cows in Highgate, Vermont munching alfalfa and flaxseed rather than corn, to make their burps less methane-laden. The farm supplies milk to Stonyfield Farms, maker of Oikos—organic Greek-style yogurt—of which I’ve just become a big fan. The one with honey on the bottom is the best; when Jack doesn’t finish his dessert honey yogurt, Peter and I jump in to scoop up the last bites. The last time I was in Highgate, I was the one standing in a field, but I was munching a messy falafel pocket at one of the Grateful Dead’s last shows. I don’t remember a whole lot about it beyond Dylan’s shiny silver jacket (he was the opening act), crowd anxiety, the falafel, and the way we punned on the name of the town as if we were the only ironic dorks who had thought of it. We make our ice cream in small batches, one day each week. We wouldn’t dream of blending our cows’ cream with anything but the highest-quality organic ingredients. We separate fresh eggs by hand, handpick the mint and black raspberries, and grind the coffee just before we brew it into the milk.